Seven celebrity soldiers will be put in brig for going AWOL to visit an adult massage parlor and bringing private mobile phones into barracks. The Defense Ministry on Thursday announced the findings of a special investigation of the entertainment corps that had been started early this month. Lee Sang-cheol, known as Sangchu, and Choi Dong-wook, the pop star more commonly known as Se7en, will be locked up in brig for 10 days for leaving their motel to visit an adult massage parlor after a performance in Chuncheon, Gangwon Province on June 21. Five others will be put in brig for four days for illegally bringing their mobile phones into barracks. And a corporal will be confined to his barracks for 10 days for going AWOL to watch a movie after the same performance in Chuncheon. The soldiers will be taken into custody after a court procedure and their period of military service extended in proportion to the number of days in custody. But their penalties will not be recorded as criminal offenses on their military service documents. The measure is widely seen as a sap to growing public discontent with the coddled existence of the entertainment corps. 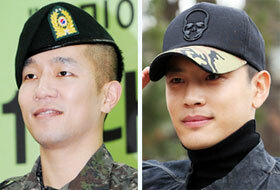 Earlier, Jung Ji-hoon, better known by his stage name Rain, was released from the military on July 10. He had been confined to barracks for seven days for going on dates with his girlfriend, actress Kim Tae-hee (33), while on official duty. The ministry on July 18 abruptly announced it is shutting down the entertainment corps, which was established for singers and actors drafted into mandatory service. Of the current 15 celebrity soldiers, three who have fewer than three months to serve will be allowed to finish their service with ordinary soldiers in the ministry compound. The others will be reassigned to frontline units in Gyeonggi and Gangwon provinces.